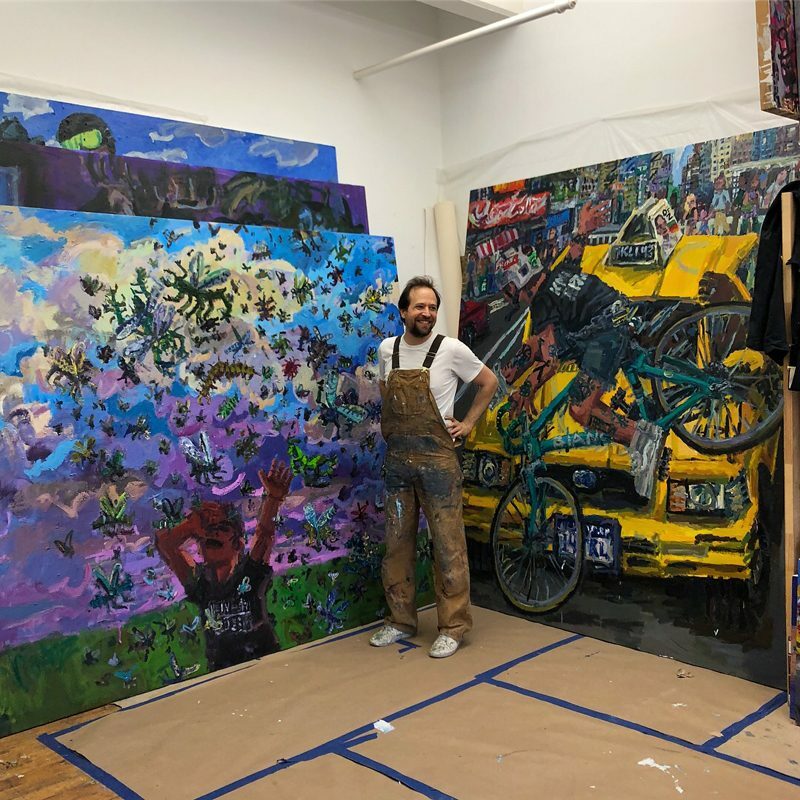 Avital Burg was born in Jerusalem, Israel, and works and lives in Brooklyn. She graduated from the Certificate Program in Painting at New York Studio School in 2013. Her solo show “Low Relief” at Slag Gallery is on view March 17-April 16, 2017. Rachel Rickert: Tell me a little bit more about your background and your current exhibition Low Relief at Slag Gallery. Avital Burg: As a child I was lucky to be in afterschool art class which took place in my village. The teacher called this class “material workshop”. Every week she would lay out on the big table a different kind of art supply such as clay, paint, wood, etc, and let us play around and make whatever we wanted from it. There was no concept of “art project” with a defined goal; it was about exploring ways of art making. 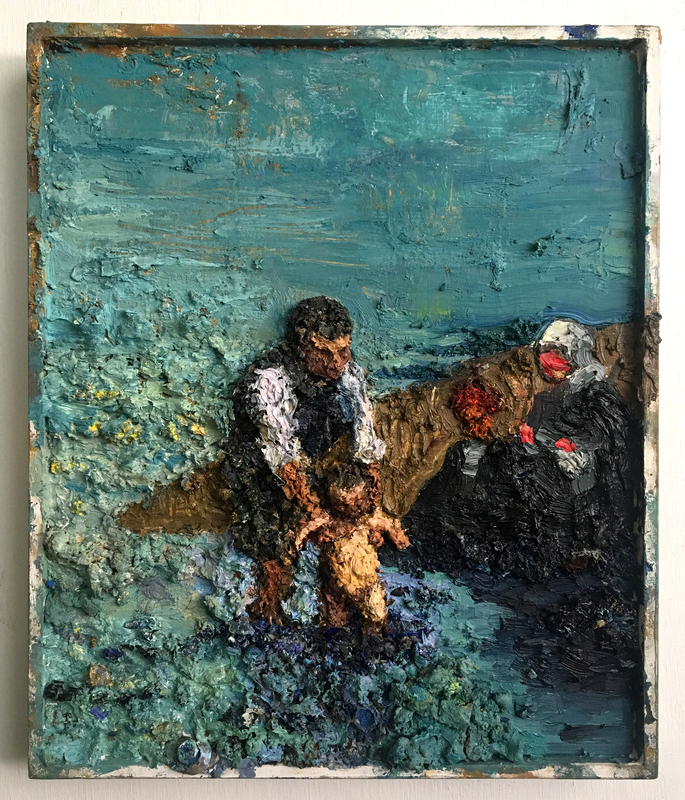 A few years later, when I decided I want to become a painter, I got frustrated that in all of these years, she, or the other art teachers I had in high school or during my one year at the Bezalel Academy, didn’t teach me what I viewed as ‘proper skills’. So I decided to go 180 degrees in the other direction: I enrolled at “Hatahana” master class program in Tel Aviv, a very rigorous two years course of drawing and painting from the model, in a realistic and somewhat academic tradition. My move to NY, and going to the Studio School, including a student exchange I did at the Slade in London, was the first step in combining the two very different art educations I had and in this combination finding my own voice, and it is a continuation of exactly this combination which acts as the basis for my new exhibition. 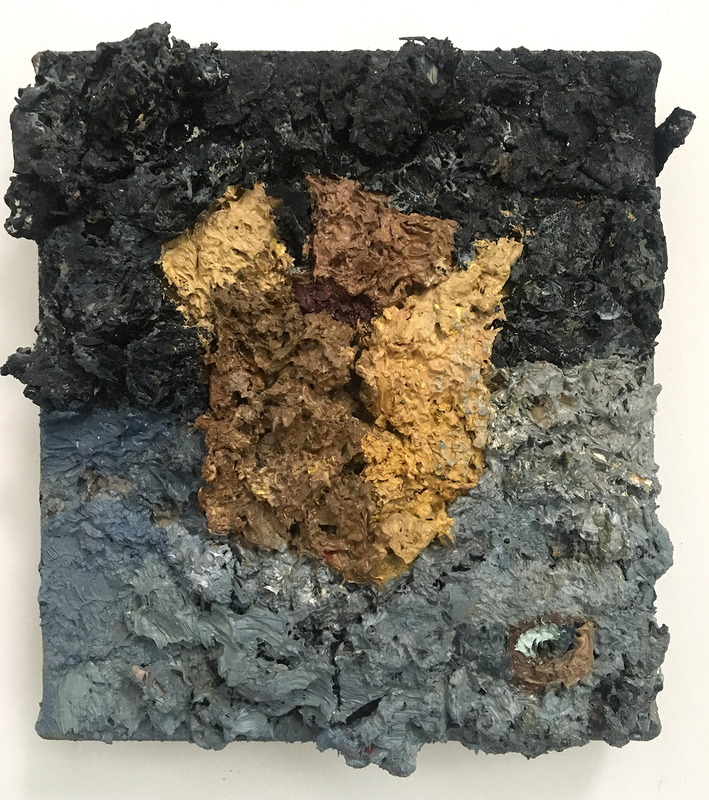 This current body of work feels as an important moment in my quest for finding how the materiality of the surface can create, disrupt and enrich the subjective reality I’m after. RR: Your work has accumulated more density and thickness since your Certificate Completion Exhibition in 2013. Can you elaborate on this progression into Low Relief, blurring the line of painting and sculpture? AB: My decision to become a painter rather than a sculptor was a very conscious one. Among other reasons I wanted to be able to stay mobile in the world, being able to move around without too much physical weight to worry about. 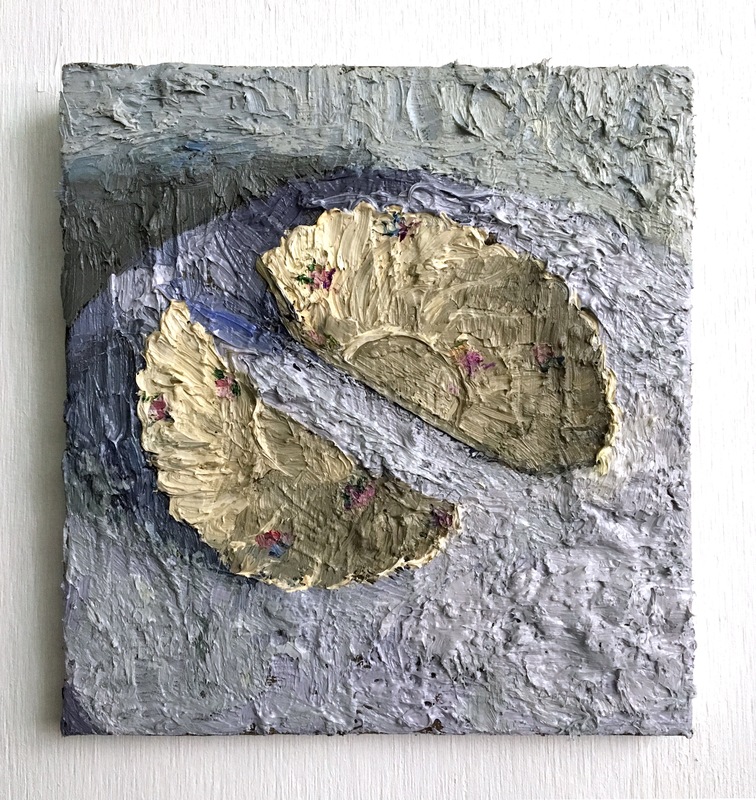 Building things, however, mainly small things, was and remained a part of my nature; it kept sneaking into my paintings in different ways: for example the cardboard dollhouses I made as props for my still life painting. Another thing was my love for the tactility of oil paint: like many other painters, when I look at art I get very close to the painting in order to get a sense of how the paint was laid upon the canvas, trying to feel the brushes in the painter’s hand. When I paint, I always have to remind myself that I can’t keep standing 2 inches away from what I’m working on, that I have to take a step back and observe, and not to fall overly in love with the tiny movements of paint. 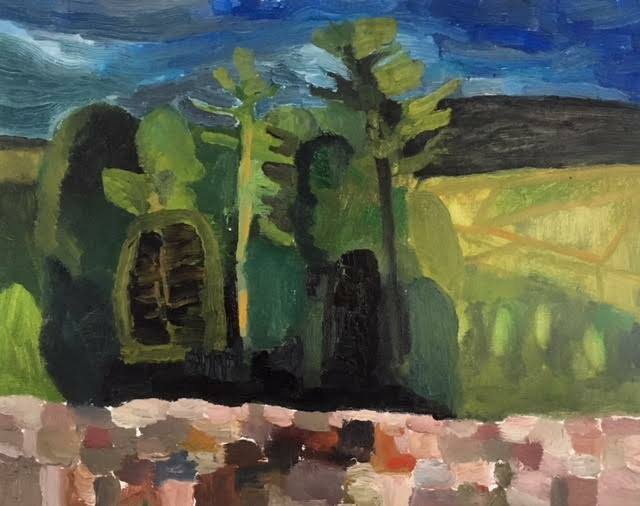 Stanley Lewis, whom I was very fortunate to study with in the Studio School, taught me through his painting that these two qualities can work together: that a painting can be both complete in its composition and form, and fascinating in its surface activity. My tendency for building things, and the drive to make the surface interesting not only when you look at it from up close, made me simply add more and more paint onto my canvases. Sometimes, when adding more fresh paint doesn’t seem enough, I use pieces of dry oil paint from my palette (which in itself looks like a relief of hills and valleys in different colors) and treat them as mosaic stones which I stick on with wet paint or even glue. RR: The surfaces of your paintings reveal both texture in relation to the form and texture in spite of the form. 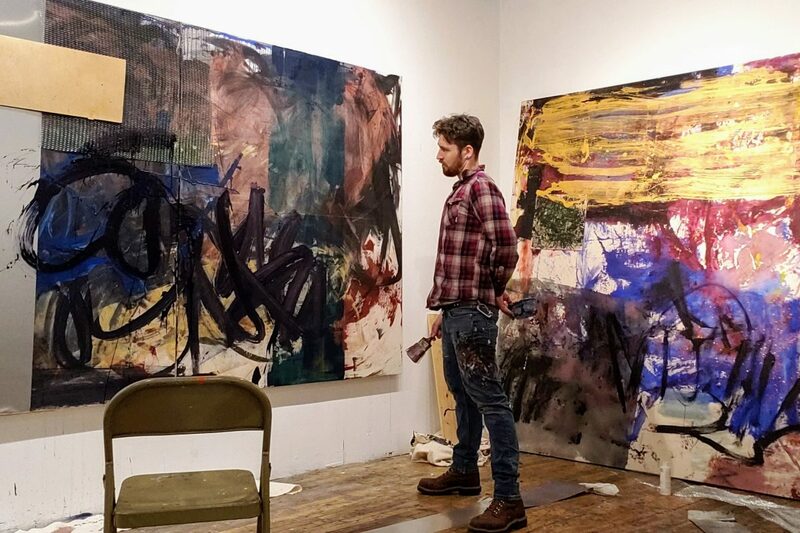 What is the physical process of building these dense paintings? AB: I’m glad you noticed that. The tension between the actual volume and what it describes, and our ability as painters to contradict between the two, is something Stanly used to talk about all the time. I think that part of what he tried to convey was that by playing with these tensions, we painters, have the privilege to add a sense of imaginative movement to our paintings. About the process, as I talked about a little before, there are no secrets, just more paint. 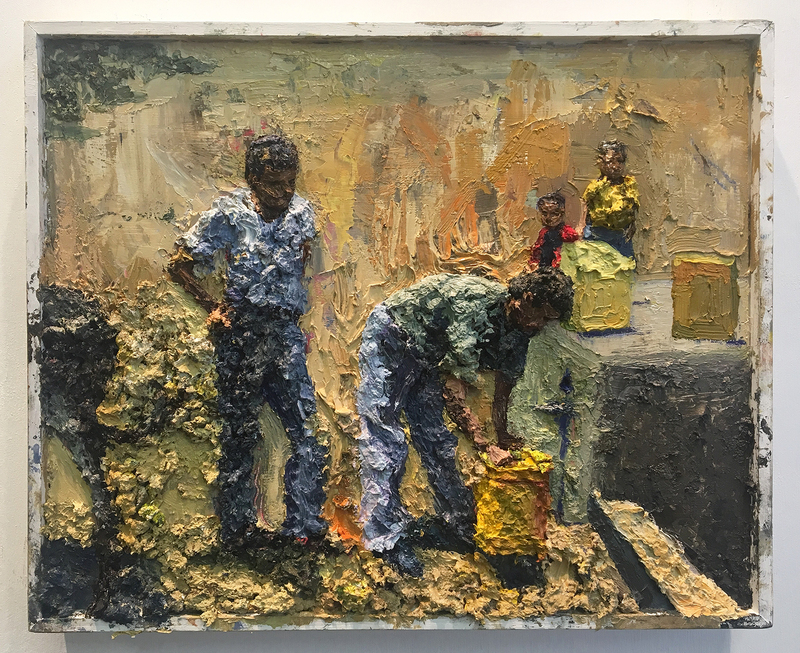 RR: Your paintings divulge a fascination with ephemera—boxes, bottles, broken moments, the gilded crumbling—how do you discover your subjects? AB: In a way this is still a mystery for me… What I can say is that in all of these objects I find there is an exciting surface element taking place. 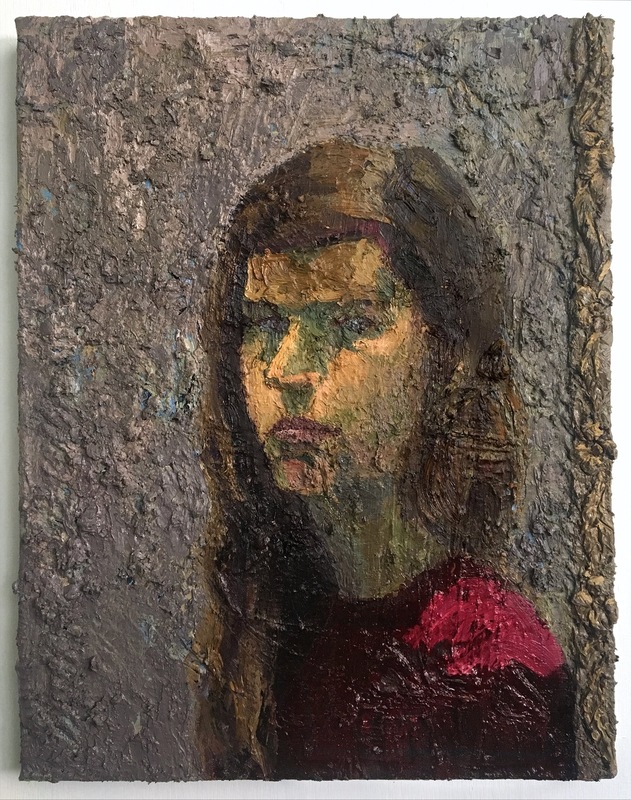 Usually the wrinkles of the box, the crack in the plate or the pealing of the gilded frame hold a memory of the object’s history, similarly to the faces in the portraits that I sometime paint. Although they all reflect a tenant of the past (may it be my water bottle from yesterday or a postcard of a 500 old painting) I try not to be too nostalgic about them, but rather to understand how I may use paint and color to make all of them present and alive in my studio, and later on in the world in general. RR: The scenes in your show, such as Yellow Jerrycans Relief, introduce action into your work that is otherwise very much about stillness. When did the figurative narratives enter your work? AB: For years, in my school in Israel and later in the Studio School, I drew and painted models every single day, for hours. When I had my own studio I felt I should be alone, without another person’s presence, just with my brushes and still lifes. Painting is a very intimate process. But not long ago, when I spent a long summer in Europe, looking at paintings in museums and people on the streets, I realized how much I miss the figure, how much I look for human interactions when I look at paintings. Honestly, I felt a little bewildered and even ashamed of how I shunned out people from my paintings. These paintings in the show are my first attempt at bringing them back. I still don’t know where it’s going to go from here. RR: Cardboard is presented as utilitarian boxes as well as playful objects, transformed into houses, worlds, and images. In past work you have also used cardboard as a surface. What sparked your interest in this material? AB: I first started painting cardboard when I was in London in the students exchange program with Slade. Although I loved it there, the temporariness of the situation made me obsessed with gathering boxes and saving them for when I had to pack and ship everything back to NY. Like everything that I keep in my studio, the boxes found their way into the painting as subjects and later as surfaces. In the beginning it was indeed as a mini house for the figurines I built, I liked the idea of a mobile house that you can send from one place to another. Later, I became interested in the cardboard itself. 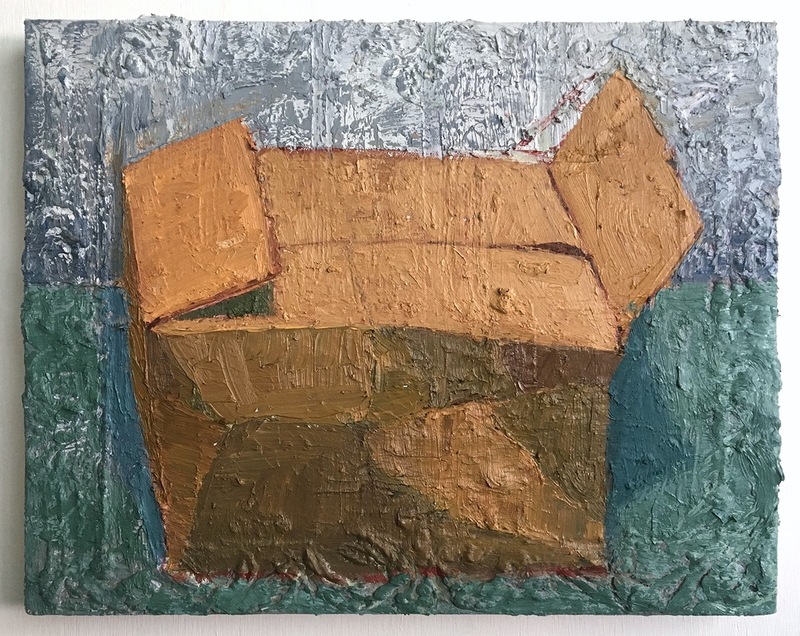 I discovered that every box I find has a different hue, which is a challenge that I enjoy very much when mixing paint and, that it’s wrinkles, tears, stamps and the tape on it tell a story of its life as a box, much like human skin tells it’s owners story. 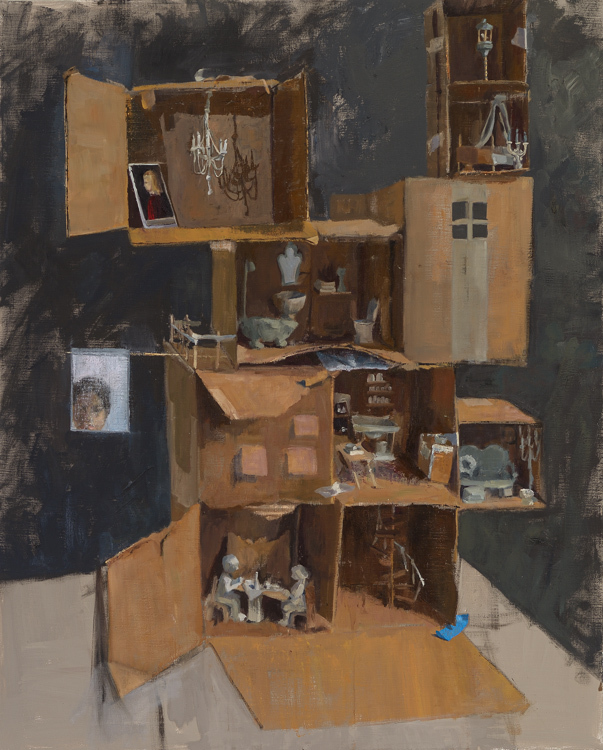 Avital Burg, Room for Rent, 2013, 50 x 40 inches, Oil on canvas. From Avital’s Certificate Completion Exhibition in 2013. RR: What are some of your favorite memories from your time at the Studio School that still influence your practice today? AB: I talked a little about my lessons with Stanly Lewis, I think about his words, and especially about the time he spent with us drawing at the most unexpected corners of the Met, almost every day. The long afternoons with Judy Glantzman in the drawing room were always magical, you never knew what to expect, once she had us draw from a video of Picasso drawing that she projected on the model. I was also lucky to be there when Susan Jane Walp, one of my favorite American painters, taught a week long drawing marathon. Whenever I get too confused in the studio I try to remind myself the feeling that I had when studying with her: that painting from life, the simplest thing, is what made me want to be a painter. To view more of Avital Burg’s work, visit her website.